The history of the London taxi dates back to 1639 when the Corporation of Coachmen obtained a licence to ply for hire in London. By 1654 Parliament limited the number of carriages plying for trade in London and Westminster to 300, increased in 1661 to 400 and 700 in 1694. Passenger safety concerns led to the introduction of ‘Conditions of Fitness’ in 1679. The first coaches are thought to have been second hand two-seaters drawn by a single horse. The majority of the horses were of a breed called Hackneys (derived from the old French word haquenee – an ambling horse or mare) which are prized for their stamina and soundness and for their ability to eat up the miles at a trot. The French carriage or cabriolet de place (hence cab) first appeared in London around 1823. In 1834 Joseph Harrison patented a two-wheel cab design with the driver sitting on top of the passenger compartment. This design was improved by John Chapman in 1836 by moving the drivers open seat behind and above the hooded passenger compartment. The driver could then talk to the (two) passengers through a window in the roof. Around this time four wheel cabs were introduced which let a third passenger sit next to the driver. Regulation of the approximately 4500 London cabs passed to the Metropolitan Police Public Carriage Office in 1850. Originally located in an annex to New Scotland Yard in Whitehall called ‘the Bungalow’. It moved to 109 Lambeth Road in 1919, remaining there until 1966, when it moved to 15 Penton Street, Islington. The first London horseless carriage taxi was introduced by Walter C. Bersey, General Manager of the London Electric Cab Company of Juxon Street, Lambeth on 19 August 1897. As the company name suggests, the cabs were battery operated and had 3½ horsepower Lundell motors and electric lights inside and out. The Prince of Wales rode in one in November 1897. The cabs, which had a top speed of 9 mph, had a removable battery box sling under the passenger compartment to allow the exchange of the 4 x 80 volt batteries – this was necessary as the batteries needed recharging every 30 miles. Initially twelve two-ton vehicles were built by the Great Horseless Carriage Company to Bersey’s design with coachwork by Mulliner (more famous for Bentleys). The cabs had a yellow and black livery and initially considered both smooth and quiet. They gained the nickname of ‘hummingbirds’ by the public. An improved version with more powerful batteries were constructed by the Gloucester Railway Wagon Company. From the operators viewpoint the cabs had a poor reliability record and were expensive to maintain with excessive tyre wear, and needing expensive replacement batteries. Added to this their reputation suffered after the first ever drunk driving conviction was handed out to 25-year-old driver George Smith who on 10 September 1897 drove his electric cab onto the pavement and into the front of 165 Bond Street (George was fined £1). Thirteen days later a nine-year-old child, Stephen Kempton, was crushed to death after his coat got caught in the chain drive after he had jumped onto the outside of an electric cab. The company ceased trading in August, 1899 with the fleet, which had grown to 77 vehicles, being sold off. The Metropolitan Police stopped licensing this type of electric cab in 1900. A single Bersey is preserved at Beaulieu. 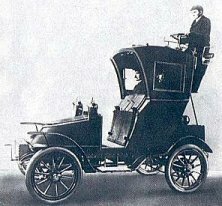 The first petrol driven cab licensed for use in London was in 1903 and was a French-built Prunel, operated by the Express Motor Service Company. It was in effect just a mechanised two-seat Hansom body with a 12hp Aster engine and chain drive transmission replacing the horse and the reins being replaced by steering column and control handles. 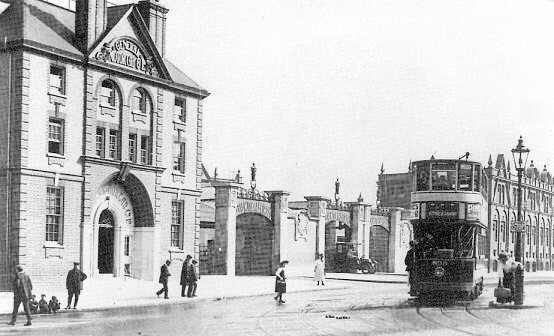 In 1905 the General Cab Company opened its premises at 1-3 Brixton Road and 1,500 taxis operated from there. The building, in a yellow and red brick and terracotta, included offices and three-storey garages for 2,000 vehicles as well as a Museum with a collection of restored taxicabs (British Pathe has a 1959 feature on the restoration of Unic and Panhard cabs (from 1912 and 1910 respectively) at the company). The building is now a business centre. In 1946 the last horse-cab was withdrawn from service and driver handed in his licence in 1947, the same year as the UK’s first radio cab service started in Cambridge.